In 2016 the Tour was fully funded by international cyclists and their registration fees. These covered not only pertaining expenses but also subsidized the participation of local riders. The registration and participation fee for the second edition of the Tour de Quisqueya is $200 per day including for arrival and departure day; This fee does not include international airfare and luggage fees for your bicycle (see more below). ​We are able to treat $100 per day as a tax-deductible donation. If you are participating for both weeks we are happy to be able to provide a discounted daily rate! This rate will be $125 per day starting with Monday February 12. You must have joined the Tour on either February 2 or 4 to qualify for this discount. 1. You will be asked to pay the full amount at the time of registration. not refundable, except if the event is canceled by the organizer. 3. If you withdraw from the event after having registered, 25% of your funds will be reimbursed, the rest will be declared as charitable and tax-deductible donations. funds depending on any already realized expenses. 5. You will have the option to ask friends for donations to meet and be reimbursed the immediate 50% donation requirement * Funds received will be refunded within 2 months of the Tour, unless you inform us to keep the difference. 6. Charitable donation receipts will be issued within 2 months of the Tour and prior to Tax Filing Deadline for the 2017 tax year. Receipts will be netted and issued separately to registrants and to those who donated on their behalf. If in addition to the registration fee itself you wish to make a donation, please visit here. * If you wish for us to create a fund raising page for you to share with friends, family and colleagues, please let us know during the registration process. * Bike rental is available but very limited. The fee is $300 per week which is aligned with the roundtrip prices charged by airlines for boxed bicycles. Revenues from bike rentals benefit the Leogane Cycling Club. You will be asked during check out if you are interested in renting (subject to availability and frame size). 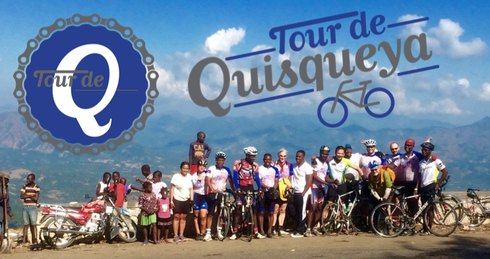 We encourage you to consider bringing an older or spare bike one-way and leaving it in Haiti to benefit the Leoagne Cycling Club after the Tour. Bring your own water bottles, cycling gear, spare tubes and tires. ​We will have limited amounts of replacement parts that can be purchased at cost. Please also refer to our Travel Guide for a suggested packing list.